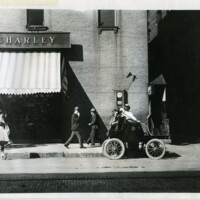 Photograph of an unknown couple sitting in an automobile outside of Cheap Charley on E. Main St. in Decatur, IL on October 7, 1907. Other unknown people are walking down the street. 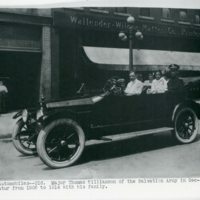 Photograph of Major Thomas Williamson with his family in an automobile in front of the Wallender-Wilder-Mattes Co. Printers office in Decatur, IL. 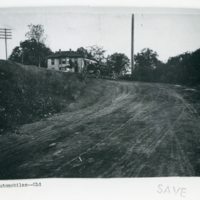 Williamson was involved with the Salvation Army in Decatur from 1906-1914.